Just before my recent visit to Nigeria, I happened to come across our IT Minister, Ms. Anusha Rahman, who mentioned that she had recently met the Nigerian Minister for Communications Technology (CT) Dr. Ms. Omobola Johnson, at the 2014 ITU Plenipotentiary in South Korea, and asked her to share details of the Nigerian award-winning program of ICT-for-Girls. 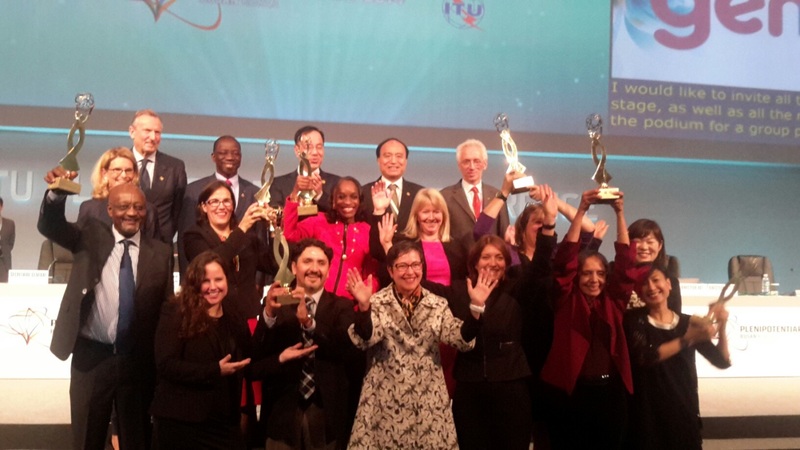 Nigeria had received ‘ITU Gender Empowerment Award’ in South Korea, for initiating policies and programs empowering women and girls via ICTs. I must mention here that I have always found Ms Rahman wanting to contribute, to do something positive, for benefit of the country (even if some people may have different opinions about the amount of success achieved so far). 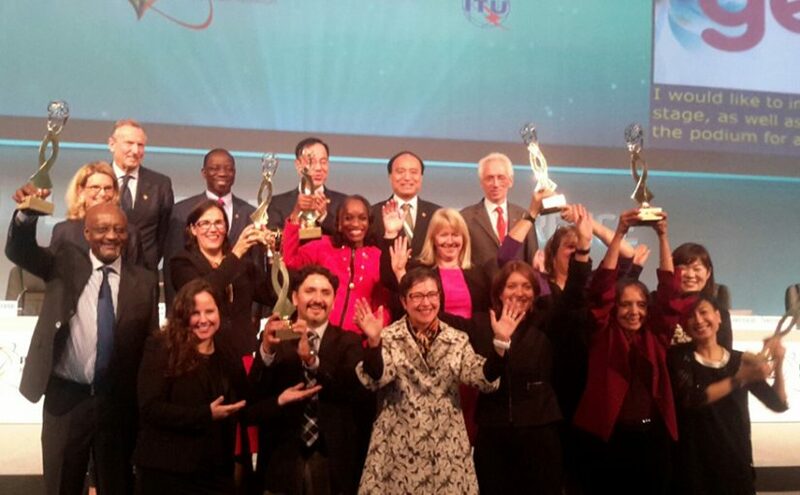 Nigerian Minister of Communications Technology, Dr Ms Omobola Johnson, with other award-recipients, at ITU Plenipotentiary, in South Korea. In any case, being father of three daughters, the subject of development of girls has always been close to my heart In particular when one reads reports such as the one by the Broadband Commission Working Group on Broadband and Gender entitled “Doubling Digital Opportunities: Enhancing the inclusion of women and girls in the information society” (http://www.broadbandcommission.org/documents/working-groups/bb-doubling-digital-2013.pdf). In this report the Commission lamented, that world-wide there are currently 200 million fewer women estimated to be online than men. We do not have any such statistics for Pakistan, but the situation is certainly worse. 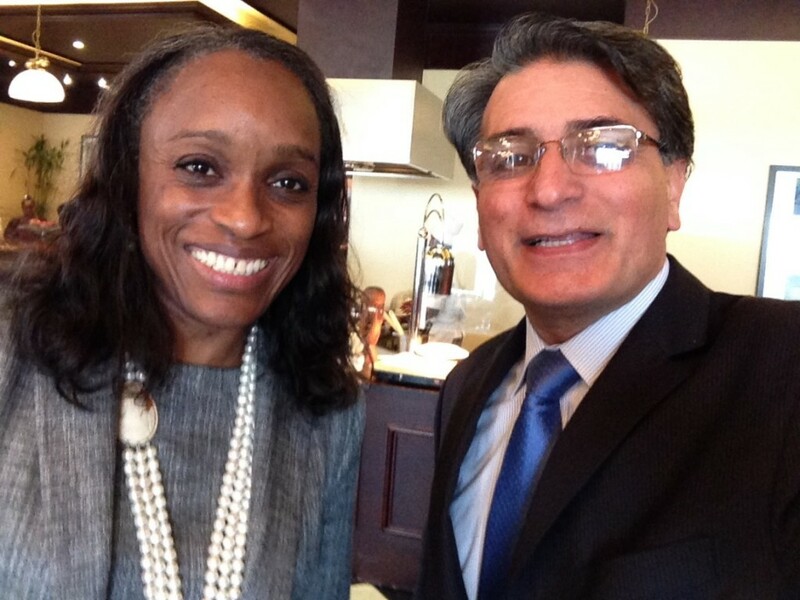 A selfie with the Honorable Minister of Communication Technology, Dr Ms Omobola Johnson, last December. In Nigeria, when I mentioned my interest to CT Minister Dr Ms Johnson, she replied that closing the digital divide has become a development priority in order to drive the economic and social inclusion of women in Nigeria. She fondly remembered meeting Ms Anusha Rahman, as “another woman ICT Minister” like her! Thanks to the CT Minister’s office (particularly Ms Abi Jagun) and head of USPF (my friend Abdullahi Maikano) I could get detailed briefings about the program. 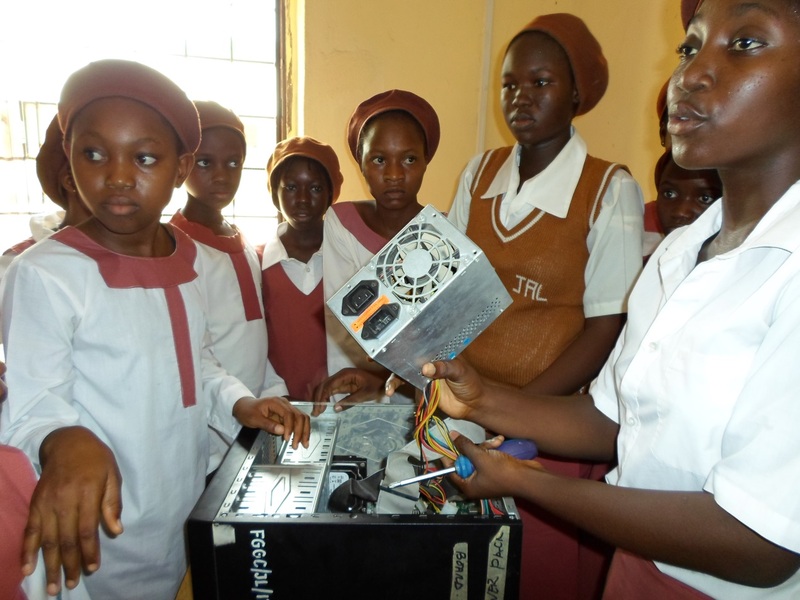 To my surprise I found out that there is not one but three big ICT-for-Girls programs in Nigeria, under the umbrella of ‘Growing Women and Girls in Nigeria’ (GWIN) initiative of President Goodluck Jonathan. Overall GWIN is being implemented through an MoU between the Ministries of Finance, CT, Agriculture, Water Resources, Health, Works and Women Affairs. Each Ministry receives extra-budgetary finance for GWIN! Actually the Federal Government requires all Ministries to make provision for gender-specific projects in their budgets, and to set up desks for management of such gender projects. It is felt that for any ground-breaking initiative to succeed, top level support, and financial commitment, are absolutely essential. The first ICT-for-Girls program of the Ministry of CT is a series of projects of ICT training of one thousand girls per project, sharing costs and responsibilities with private sector sponsors. Participating girls are required to have cleared Polytechnique Diploma course first. The Ministry pays for bringing batches of girls to the training venues plus their boarding and lodging. The private sector partner (sponsor) takes care of training, including training aids and the training venue. But the target is not just any ICT training. The emphasis is on improving employability of the girls. The sponsor even commits to either employ, or get employment for, at least 20% of the girls completing their training. The first such program is run together with the Chinese telecom equipment manufacturer Huawei, and is, therefore, called “Huawei 1,000 girls for ICT”. It is expected that several such projects will follow involving other companies, for wxample “Cisco 1,000 girls for ICT” and “MTN 1,000 girls for ICT” etc. 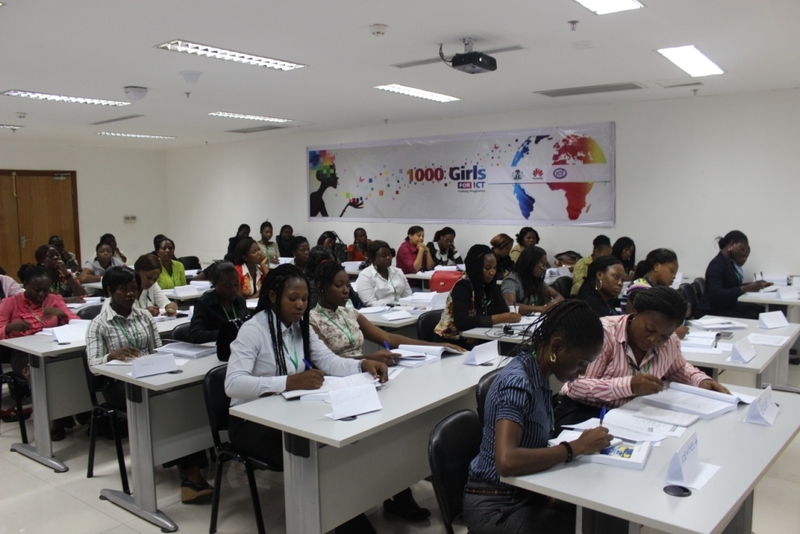 A 1000 Girls for ICT class in Lagos. The second program is called “Digital Girls Club”. Run on the lines of girl-guides program, it is a program to help girls develop an early interest in the field of ICTs. It is run in partnership with Universal Service Provision Fund (USFP)) of Nigeria. Girl students in those schools and colleges become members of the Digital Girls Club where USPF has provided internet and computer labs, under its “School Access Program” (SAP). Participation is voluntary and classes are held after school-hours a couple of times every week. The course has three terms, running over a full school year. It is implemented through one or two teachers of the school/college, who are specially trained for the purpose. The curriculum is prepared with the help of civil society, predominantly by women who are already working in ICT sector in the country. Girls learning to disassemble PCs at a Digital Girls Club. The third program “Smart Woman Nigeria”, is actually a platform, accessible to ordinary women who own mobile phones, but are unable to take advantage of opportunities offered by ICTs, due to lack of knowledge and difficulty in accessing relevant information. Smart-Woman offers learning, tips, advice and mentoring in communication skills, managing finances, health, and family work/life balance, parenting, etc, by developing and making available relevant content to meet the needs of women. The content is in the form of SMS, as well as Voice-SMS, so that those who cannot read, may also benefit. Smart-Woman project services are offered free to rural women – paid by subscriptions of higher income women in urban areas. The second phase of the program will also incorporate discussion and bulletin boards. The development of this program is said to have been the result of participation of many stakeholders, ministries, etc., including the eleven-year old “Women in Management, Business and Public Service” (WIMBIZ), a civil society organisation with a large network of professional women in Nigeria and “Change Corporation” USA. The development of the platform and mobile applications that deliver information are being developed locally, furthermore, the content being disseminated is hosted within the country. All this also results in development of local content in Nigeria. I am convinced that such programs could easily be modified according to local requirements, and replicated in countries like ours to help women and girls get ahead – provided commitment from the very top is forthcoming.